Every color has its beauty, depth and character. Some colors are more potent than others and make you see them, demanding your reaction, good or bad, no matter what. The colors you choose, reflect you. Your color palette can summarize your bio. I feel extra pressure today. I am hosting a Queen! Yes! and not just any queen, the Queen of Hearts & Darts! 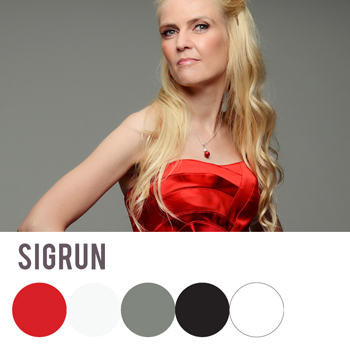 Sigrun can’t imagine a world without RED. Her heart, head and wardrobe, are all ruled by red! What she does? She is helping you build a solid foundation for your online business, helps you with sales funnels and launches and also delivers actionable steps from her webinar throne, so that you can just GO for it! How do you describe your Favorite Color? When did your Favorite Color become your Favorite Color? As long as I can remember red has been my favorite color but I was 16 years old when I really started use it consciously. 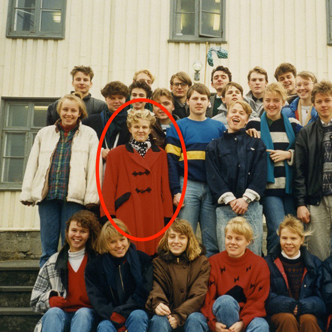 It was also the color for feminism at the time – we called them the red socks in Iceland and I loved that connection. How did you start using your Favorite Color for your biz? I remember getting my own room as a child, probably at the age of 10 and I decided how we designed it. It was very clean, all furniture was white and the walls were white but then I had black cover on my bed and black frames around pictures and then my office chair was red and I had a red Coca-Cola box, red lamp etc. Overall black and white theme with a splurge of red. Just like my brand today. Do you have a color palette and do you use these colors consistently? One favorite thing you own, in your favorite color? 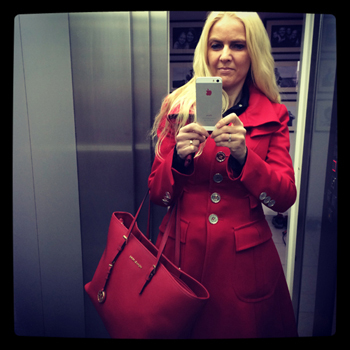 I have a red coat and over the years since and I was a child I have always had a red coat. And every time I wear it I feel I am really me! I also have red dresses, red handbags and red shoes. Most of my clothes are black but I like to spice it up by red accessories. One thing on your wish list, in your fave color? 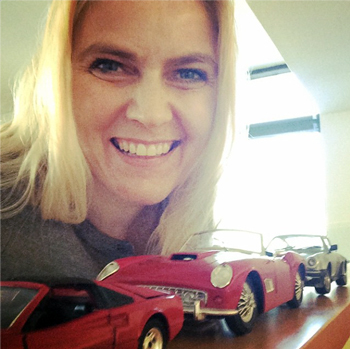 Since I was 16 years old I wanted a RED Porsche 911. I have it, in small, but not in big yet. And I am not sure I want to have it really but it has been on my vision board since I was a teenager so I guess I just need to have it for a week and then my vision is fulfilled. The color red is inseparable from me. To anyone who knows me the color red and my name are synonyms. I just need to see the color red and I immediately get interested exploring the colored object or image further, it inspires me to take action. My currently favorite song is HAPPY. The song doesn’t talk about the color red but to me the color red is happiness and just playing the song Happy I get a warm happy feeling. Quote related to your Favorite Color? * Did you notice how Sigrun does very well with her reds without using one of the most prominent characteristics for an all-womanly dress up–a red lipstick? Ha! Gotta love that! So, Which color sets YOU off?? for action, for dreaming, for loving? Do Tell!!! !